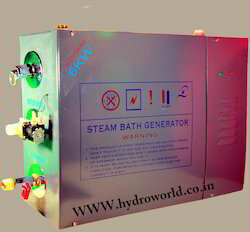 We are a leading Manufacturer of steam bath generator from Delhi, India. Our firm is manufacturing a wide variety of Steam Bath Generator for our valued patrons such as Sauna Bath, Steam bath cabin. These product are designed as per current looks and developed from high quality material that is acquired from trustworthy vendors. The complete range is designed under the strict direction of quality experts to make more luxury, standard finish and attractive looks. Water level Sensor cut-off to ensure heater safety. Flexible hose connector for water feeding. It does not only relax your muscles but most importantly it will keep your emotional mood more stable and happy.Various ailments such as arthritis, muscle pains and the like can be relieved because of its warm effect to the body. Soothers mind & Body to relieve stress & relax muscle. Relieves discomforts of asthmas, allergies & arthritis. Keep mucous membranes from excessive drying. Relieves throat irritation by moistening the air. Relieves inflammation & congestion of upper respiratory mucous membranes. Loosens secretions & stimulate discharge of mucous from the throat & lungs.